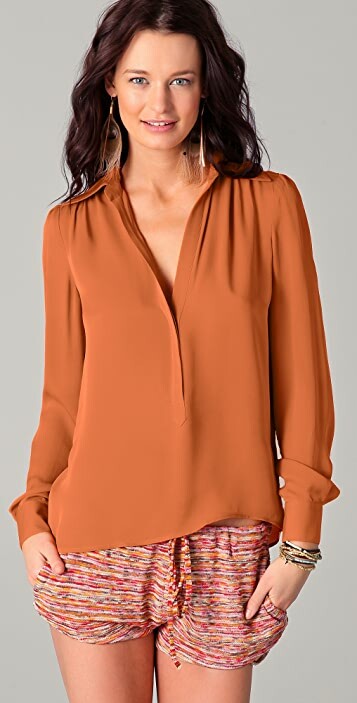 This silk-chiffon Haute Hippie blouse features a V neck and a fold-over collar. Hidden 3-button closure. Ruching at yoke and at 2-button cuffs. Long sleeves. Semi-sheer. I purchased this blouse in the turqoise color which is beautiful . It is a simple and classic style blouse that is made very well. I usually wear an xs in blouses but sized up to a s to have it have a looser fit which is more casual. It's a nice easy blouse. Clementine color is beautiful and looks exactly like shown on picture. The V-nek is really deep, I thiink I'll have to wear a tank underneath. It might seem to run a little large if you're not too tall and have narrow shoulders.